Peel the skin off the beet. Then use the peeler to shave thin strips from the beet. (or the mandolin to make thin slices). Peel and slice the orange into thin rings. Slice onion into thin strips. Chop pistachos. Add all of it into a bowl. In a small container with a lid, add 1/3 cup olive oil, some balsamic vinegar, 2 spoons of garlic paste, a squirt of honey and the sesame seeds. Put the lid on the container/jar and shake well. Dress the salad and voila! 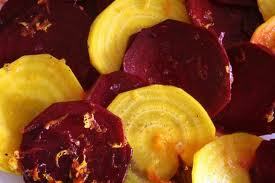 This entry was posted in low iodine, Recipes, Recipies, side and tagged beet, CSA, orange, salad, vegetarian. Bookmark the permalink.